Toners, primers, HD foundations, and serums—we've rounded up the best of pore minimising products you need right now! Irrespective of our skin type, most of us have constantly been at war with the pores in our skin. Pores are often the long withstanding barrier between the flawless skin of our dreams and the uneven, acne-, blackhead- and blemish-prone skin we have! Although there are no ways of shrinking them for good; there are a bevy of effective products out there that cover, blur, and minimize the appearance of these crevices on our face. 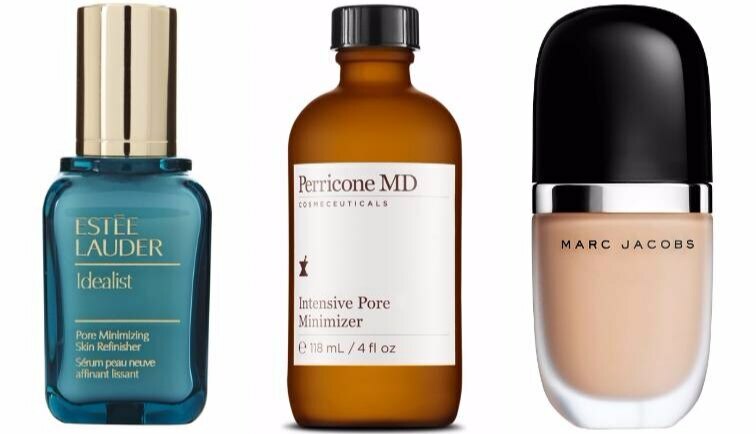 Here’s our carefully-curated list of top 10 pore minimizing products for you to try! Combining alpha lipoic acid, salicylic acid, and mineral complex—this ultra effective toner exfoliates the skin to normalize oil production, swipes cleans dead skin cells and dirt, and tightens the skin for a poreless complexion. It visibly reduces the appearance of enlarged pores and keeps the skin clean. This cult favourite, fast-acting serum delivers dramatic results in the shortest span of time. It not only reduces the size of pores, it repairs uneven skin texture, flakiness, and roughness for a soft, seamless, and silky skin. It’s not over! It also gives the skin an overall more even tone. Just apply on clean skin before using moisturizer and watch the magic unfold. This cult favourite lightweight primer is a must-have for your wedding makeup trousseau! It is gently tinted and seamlessly glides on skin to plug large pores and uneven texture, leaving behind a smooth but not suffocating canvas. It creates the base for any kind of makeup that lasts long and looks flawless throughout the day. Packed with Activated-X charcoal and super absorbent carbon—this mask attracts toxins and dirt from the deepest pores and leaves the skin clean and poreless. The brand promises immediate results in just one use. These sheet clay masks are ideal for all skin types and help cleaning up oil, dirt, and gunk that can clog pores and make skin look dull. Infused with kaolin and bentonite clay, these two-step masks purify the skin and clean any dirt residing in your pores leaving it fresher than ever! A high-definition foundation powder by Chanel that has infused mica powder that captures and diffuses softer light to flatter the complexion. The Canola oil in it improves skin suppleness and SPF 15 provides protection from the sun. This radiating powder promises to minimise pores in the mattest way possible. Truly one of a kind, this product uses Buoyancy Gel technology to create a bouncy and youthful complexion. The characteristic feature of this is that it seamlessly covers any irregularities on the skin, including pores, and never settles into creases. This very potent serum visibly makes your skin look young by clearing off any grime or dust on the skin’s surface. It makes the skin tighter and reduces the size of enlarged pores. Makes the skin look younger and smoother. But the best part is its oil free so works on all skin types!